U.S. stocks ended lower Monday, as investors remain cautious ahead of a key decision out of Europe and the Federal Reserve's latest policy meeting. The Dow Jones industrial average fell 0.4%, the S&P 500 slid 0.6% and the Nasdaq declined 1%. Intel (INTC) was the worst performer on the Dow, after the world's largest chipmaker said last week that third-quarter sales will be weaker than expected. But the blue chip index was supported by gains in shares of Hewlett Packard (HPQ). Investors were sidelined ahead of the Federal Reserve, which could announce new stimulus measures when it wraps up its two-day meeting on Thursday. Friday's weak jobs report prompted further speculation that the central bank will move forward with a third round of quantitative easing, a possibility Fed chairman Ben Bernanke alluded to in a speech last month. But investors were more circumspect Monday about whether the Fed will act this week, or hold off until later in the year, said Todd Salamone, senior vice president of research at Schaffer's Investment Research. "Some are expecting QE3 to happen, but they're unsure of the timing," he said. Poll: Will the Federal Reserve announce QE3 on Thursday? Meanwhile, investors will be keeping tabs on Europe, as the German Constitutional Court is expected to hand down a ruling Wednesday that could impact the European Central Bank's plans to preserve the euro. The European Central Bank announced its own bond-buying program last week, aimed at keeping the continent's debt crisis at bay. Investors are also awaiting details on the European Union's proposal to create a new banking authority, general elections in The Netherlands and a meeting of euro area finance ministers later this week. "The market is digesting last week's gains with a multitude of events ahead of us," said Art Hogan, a managing director at Lazard Capital Markets. U.S. stocks closed out their best week since June last week. World Markets: European stocks ended mixed. Britain's FTSE 100 and the DAX in Germany both ended little changed, while France's CAC 40 fell 0.4%. Asian markets closed mixed Monday. The Shanghai Composite added 0.3%, the Hang Seng in Hong Kong rose 0.1%, and Japan's Nikkei was slightly lower. Chinese imports fell 2.6% in August while exports grew less than expected in the latest sign of weakness in the world's second-largest economy. Companies: Shares of fashion label Michael Kors (KORS) dipped 4.3% on news that the company plans for a secondary offering. LeapFrog (LF), which makes "technology-based" toys, including tablet-like devices, was under pressure after Toys R Us unveiled a new tablet computer for children. Shares of Sprint (S) rose 2.5% after analysts at Nomura Securities upgraded the stock to "Buy," saying the valuation remains compelling. Currencies and commodities: The dollar gained strength against the euro, the British pound and the Japanese yen. Oil for October delivery fell 12 cents to settle at $96.54 a barrel. Gold futures for December delivery fell $8.70 to end at $1,731.80 an ounce. 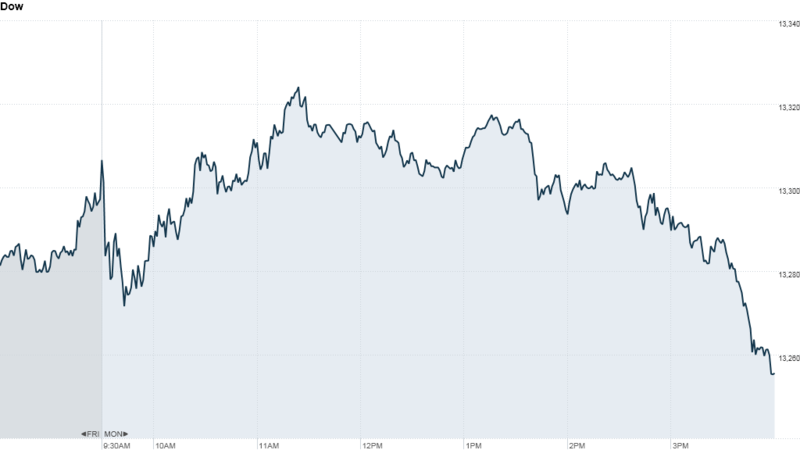 Bonds: The price on the benchmark 10-year U.S. Treasury fell, pushing the yield up to 1.68% from 1.67% late Friday.